NOTICE: Activation key must be used on a valid Steam account. Requires internet connection. ABOUT THE GAMEA New Beginning - Final Cut is a cinematic adventure-thriller done graphic novel-style. In this charming and witty adventure, earth is on the brink of impending climate cataclysm. It's essential to travel the world in order to spare mankind and save the whole from this terrible fate. … Bioengineer, Bent Svensson, had to resign from researching alternative ways of generating energy. Now the former workaholic lives a secluded life in the remote forests of Norway. His early peaceful retirement is invaded by Fay, a young woman claiming to be a time traveler from the future. She tries to convince him that she's here to prevent the climate cataclysm from happening and according to her, Bent's research is the last hope to achieve just that. However, his results are on the verge of falling into the hands of a reckless energy tycoon who cares for nothing but his own profit.Together, Bent and Fay now have to put an end to the imminent global catastrophe.KEY FEATURES A fully fledged adventure-thriller, tackling on the contemporary issue of global warming More than 100 breathtaking, highly detailed backgrounds More than 20 hours worth of game time Unique graphic novel style with an hour worth of animated comic cutscenes A masterpiece, written by the creators of 'The Whispered World', 'The Dark Eye: Chains of Satinav', 'Harvey's New Eyes' and the 'Deponia' Trilogy SYSTEM REQUIREMENTS Windows:Minimum: OS:Windows XP Processor: 2 GHz (Single Core) or 1.8 GHz (Dual Core) Memory:1500 MB RAM Graphics:OpenGL 2.0 compatible with 256 MB RAM (Shared Memory is not recommended) DirectX®:9.0c Hard Drive:5 GB HD space Sound:DirectX compatibleRecommended: OS:Windows Vista/7/8 Processor:2.5 GHz (Single Core) or 2 GHz (Dual Core) Memory:2 GB RAM Graphics:OpenGL 2.0 compatible with 512 MB RAM (Shared Memory is not recommended) DirectX®:9.0c Hard Drive:5 GB HD space Sound:DirectX compatibleMac: OS:Lion (10.7) Processor:2 GHz (Dual Core) Intel Memory:2 GB RAM © 2010 Daedalic Entertainment GmbH. 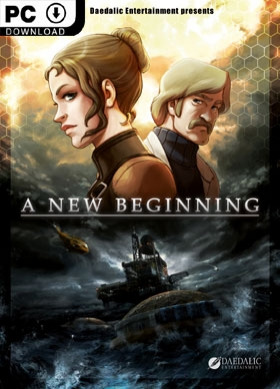 A New Beginning, the A New Beginning logo and the Daedalic logo are trademarks of Daedalic Entertainment GmbH.All rights reserved.